Today kicks off New York Toy Fair 2016, and that brings along with it a sneak peek at the first ever Luke Skywalker toy based on his likeness in the blockbuster hit sequel Star Wars: The Force Awakens. 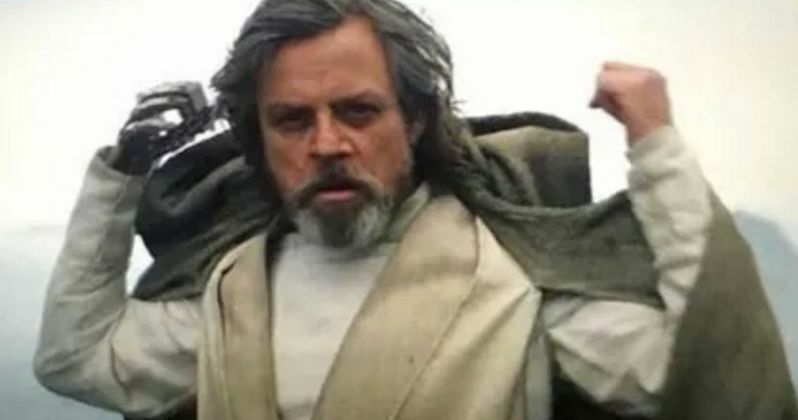 Leading up to the movie's release in December, Luke was the only old school character not included in any of the promotional material. And two months after the release of the movie, we have yet to see any toys based on his new appearance. Until now. The first Force Awakens Luke Skywalker figure is actually part of the incredibly popular Funko Pop line. These vinyl figurines are a phenomenon unto themselves. And over the last few years, we've seen plenty of characters introduced as part of their Star Wars line-up. Later this year, we'll be getting another wave of figures and bobble heads directly based on those characters seen in Star Wars: The Force Awakens. This latest Funk Pop Star Wars series includes a bunch of fan favorites. At the top of the most wanted list alongside Jedi Master Luke Skywalker is his sister Geeral Leia Organa, who is seen in her Resistance leader outfit, from when she oversees the attack on the Starkiller Base. And mega-popular viral sensation TR-8R is also getting his own Funko Pop. Though, he arrives under his real name FN-2199 (Nines for short). This Riot Trooper will be wielding his mighty Riot baton. But wait, there's more. We'll also get a new Rey Funko Pop, which shows her wielding the iconic blue lightsaber that has been in the Skywalker family for generations. She will arrive alongside Kylo Ren, who is now available in a fighting pose, with blood splatter on his face, and his now-legendary red lightsaber ready for attack. The rest of the new line-up, which will be available at retailers later this year, include Admiral Ackbar and ace X-Wing Pilot Snap Wexley, both returning in 2017's Star Wars: Episode VIII. Force-Sensitive barkeep Maz Kanata will arrive with her signature goggles in tact, and Castle denizen CO-74 will be standing proudly on toy shelves alongside her. First Order General Hux will also be included in this line-up, along with the Guavian warrior. You can take a look at all the new Star Wars Funko Pops in the image below.